The National Thoroughbred Racing Association, Daily Racing Form and the National Turf Writers and Broadcasters today announced that Joe Harper, who has led the Del Mar Thoroughbred Club over the past 40 years and enabled Del Mar to become one of North America’s most successful racetracks, has been selected to receive the Eclipse Award of Merit in recognition of a lifetime of outstanding achievement in Thoroughbred racing. Harper, Chief Executive Officer of the Del Mar Thoroughbred Club, will receive the Award of Merit at the 48th annual Eclipse Awards Dinner and Ceremony honoring the 2018 champions of Thoroughbred racing on Thursday, January 24 at Gulfstream Park Racing & Casino in Hallandale Beach, Fla. Since coming on board in an executive capacity at Del Mar in 1978, Harper has guided this majestic seaside track—founded in 1937 and bordering the Pacific Ocean just north of San Diego—through a period of sustained growth and success to become one of the leading facilities in North America. For many core and casual racing fans, Del Mar is considered a “must see” destination featuring an ambiance of casual elegance accentuated by world-class racing and an extraordinarily entertaining customer experience. "American Racing has the tradition of Saratoga, the history of the Triple Crown, the majesty of Santa Anita, and the unbridled joy of summer at Del Mar,” said Hall of Fame trainer, two-time Triple Crown winner and four-time Eclipse Award Outstanding Trainer winner Bob Baffert. “Joe Harper is the maestro of that summer celebration, the exuberant leader who makes sure every year that Del Mar maintains its special place in racing’s heart. Joe Harper is Del Mar, Del Mar is Joe Harper, and no one deserves the Eclipse Award of Merit more than Joe." Under Harper’s stewardship, Del Mar has grown to the point that it now offers some of the west’s best racing, as well as its highest overall average daily purse structure, which in turn has led to robust handle figures. In recent years the track also has taken a prominent position in health and safety measures for its horses and riders that have proven highly effective and been emulated by others in the industry. Hosting a record-setting 2017 Breeders’ Cup World Championships. In 1978, Harper took on a leadership role at Del Mar after serving at Santa Anita as Executive Vice president of the Oak Tree Racing Association. At Del Mar, Harper first served as executive vice president and general manager. Then in 1990 he took on the roles of president and chief executive officer. In 2018, he relinquished the role of president, but continues as the track’s CEO. He has been a director of DMTC since 1985. At the same time, Harper is renowned for getting close to those who work on the grounds each day a Del Mar. For many years, Harper would get on a pony and take up a spot near the backstretch gap at sunrise where workers and gallopers would enter the track. Horsemen got used to seeing him and eventually would amble over on their horses, and relate there every day experiences. “We solved a lot of Del Mar problems before they ever became problems,” Harper noted. One of those problems Del Mar faced was changing times in the racing world. Del Mar has a rich history based on its co-founder, show business icon Bing Crosby, and all his Hollywood friends. To this day, each racing card begins and ends with a recording of Crosby’s song, “Where the Turf Meets the Surf.” But racing’s attendance fortunes began to change in the late 1990s and early in the 2000s with the advent of full card simulcasting and flagging attendance. Del Mar faced the challenge of selling itself to a younger, stylish crowd that wanted more than the past to believe in. The campaign, which featured additional events including world class horse racing, proved eminently successful in revitalizing the on-track experience at Del Mar as a must attend event, with attendance increasing as much as 25% over the past two decades. The campaign earned such prominence that it was adopted as a case study by the Stanford University Graduate School of Business. Harper’s dream of hosting a Breeders’ Cup World Championships at Del Mar was realized in 2017 with spectacular results. Del Mar was announced to host the event in 2014, which coincided with the opening of a new and expanded turf course. The track was enhanced with temporary structures to add to the existing ambiance. Del Mar set a Breeders’ Cup on-track record handle of $25,181,317 over the two days of the Championships. The economic impact on the San Diego community reached $96 million. In addition to his work for Del Mar over the years, Harper also is involved in a wide range of industry and community activities. He is a member of The Jockey Club, the Grayson-Jockey Club Research Foundation and the Advisory Board for the University of Arizona Race Track Industry Program. He is the former President of both the Thoroughbred Racing Associations of North America and the Federation of California Racing Associations. He also serves as Chairman of the Advisory Board of the California Center for Equine Health at U.C. 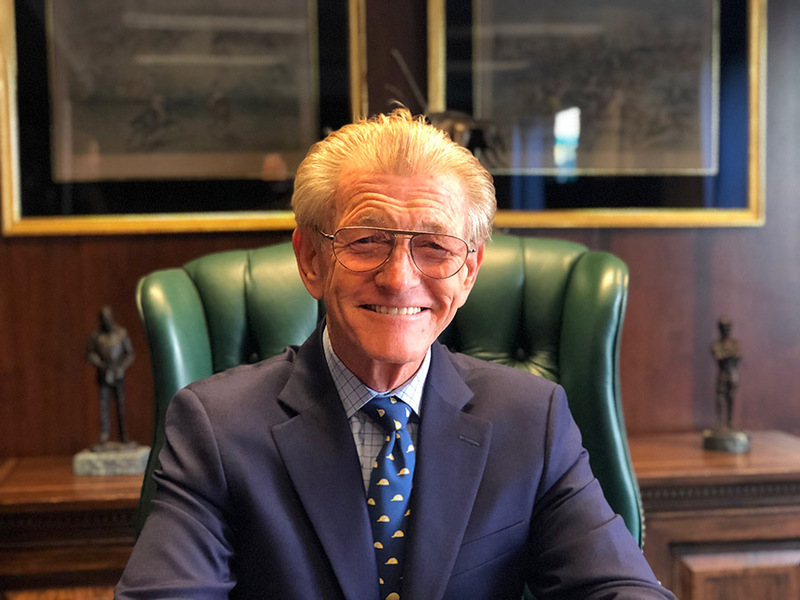 Davis, and as Chairman of the Winners Foundation, a drug and alcohol counseling center for the California racing industry. Additionally, he serves on the board of the San Dieguito Boys and Girls Club. Harper takes personal pride in serving as a Trustee of the Cecil B. DeMille Foundation. Through that Foundation he has been very active in supporting education and film preservation at U.S.C., U.C.L.A., and Chapman University. The DeMille Foundation was the major contributor toward the construction of the Academy of Motion Picture Arts and Sciences Research Center in Beverly Hills, Calif.
Harper and his wife of 55 years, Barbara, live in Del Mar. They have four daughters and nine grandchildren. Eclipse Awards tickets are available for $425 each or $4,000 for a table of 10. Blocks of rooms have been reserved for Eclipse Awards guests at the JW Marriott (formerly the Turnberry Isle Resort) in Aventura, Fla. Additional details can be found on the NTRA website at NTRA.com/eclipse-awards. The “black-tie optional” Eclipse Awards is part of a full week of events that will culminate with the third running of the $9 million Pegasus World Cup Invitational and the inaugural running of the $7 million Pegasus World Cup Turf Invitational, on Jan. 26. Separate tickets to the Pegasus World Cup are available on the Gulfstream Park website at pegasusworldcup.com. Tickets to the Eclipse Awards also include an invitation to a spectacular Friday night, Jan. 25, party in the Gulfstream Park walking ring on the eve of the Pegasus.